I was relaxing in my recliner last evening listening to the thunder and rain telling me I could not go on my usual afternoon walk. In a short while it all stopped. The room was looking weird. I just figured it was the sun coming back. My sister text me saying " wow the sun is a big pink ball!". I jumped up and ran outside. I didn't see the sun but there was a beautiful pink hue all around. It was like looking through a red lens as I focused on the sky. It was pink. I had to snap a photo. It was beautiful but still sort of an eerie feeling that made me think of an old sailors poem. "Red sky at night, sailors delight. "Red sky in the morning, sailors take warning". This saying has been used by sailors for over 2000 years. 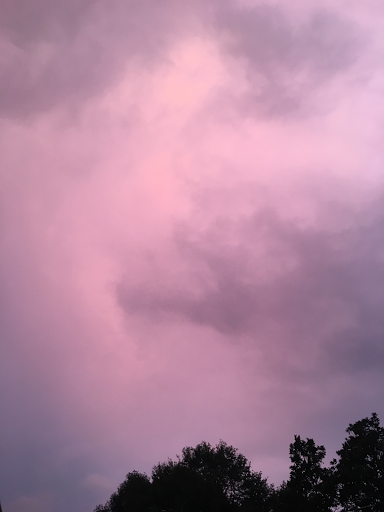 The pinkish sky in the evening is caused by the light of the setting sun. The sun sets in the West at the same time the world is spinning therefore the sun shine bounces off moisture from the clouds that are actually moving away, giving a sign that tomorrow will be clear. On the other hand, a red sky in the morning could predict the opposite with signs that a storm is approaching and he sailors will take shelter on land. My rule of thumb...If it's raining so hard a salmon could take a stroll, or the wind is blowing hard enough you can't stand straight...stay in bed. I was telling Stella a story using chalk on the outdoor carpet. She makes a mark and I draw a picture and tell a story surrounding her mark. Sherry said the sky looks strange. We had a lot of cloud cover and over in the B-town we only got the light pink hue but really bright. We are over nighting near Savannah on the way south. Ooooh, so pretty! We had rain most of the night last night. And I hear thunder in the distance right now. Sunset was reddish, so I guess we are in for a nice day tomorrow. The moon can be "red" for the same reason of how reflects upon it.